BUILT explores the changing city in the US and the challenges that will affect housing, infrastructure, neighborhood cohesion, and equity in the coming years. 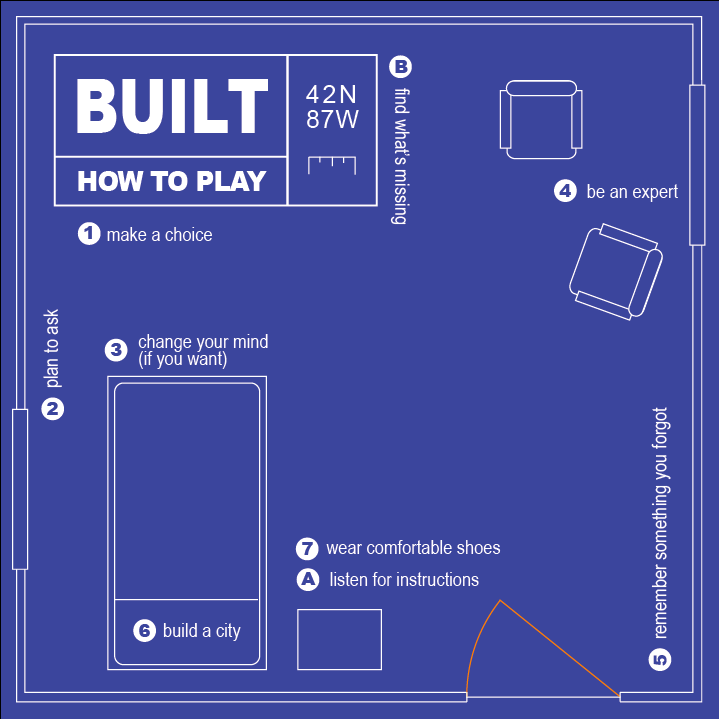 BUILT is a series of research, installation, dialogue, interview, and performance events of varied scale, including the opportunity for public conversation offered at this blog. This week we celebrate the culmination of academic and public discussion in other forms of cultural performance. For those in the Chicago area, don’t miss the second image below. The first image is for any reader near or far who wants to play a name game. The image outlines a simple game. The game is named BUILT, but let’s pretend that is not going to sell. Another name is needed–one that will both capture the public imagination and communicate the idea of citizen participation in urban development. Now, conjure a name for the game. Or, if the name alone isn’t going to do the trick, suggest changes that ought to be made in the game: What steps should be added or skipped? Should the visual design be altered or changed completely? How do we imagine change or development or getting people involved in making decisions about the urban fabric? 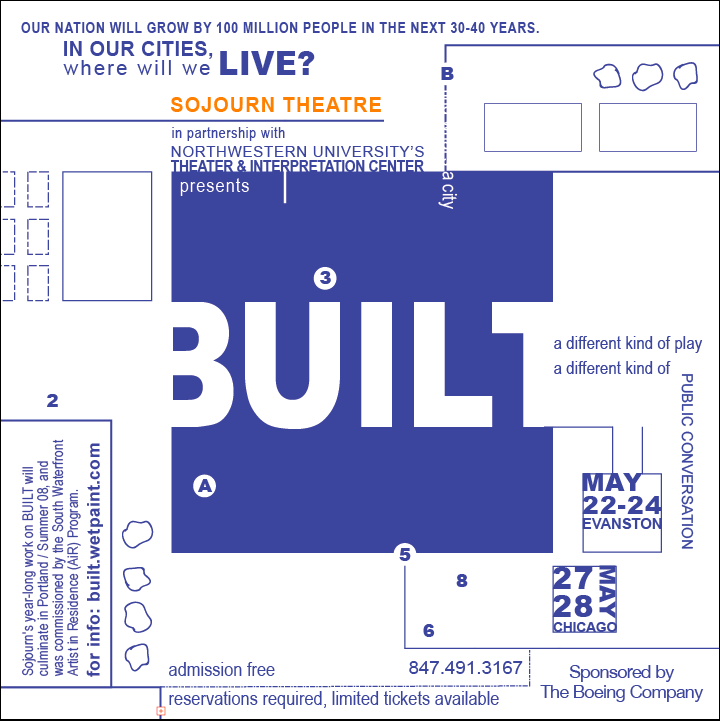 BUILT is a performance/civic dialogue project and a collaboration of Northwesten University’s Theater Department & Portland, Oregon’s Sojourn Theatre, led by visiting artist Michael Rohd. BUILT: Why Can't Bikes and Cities Just Get Along? 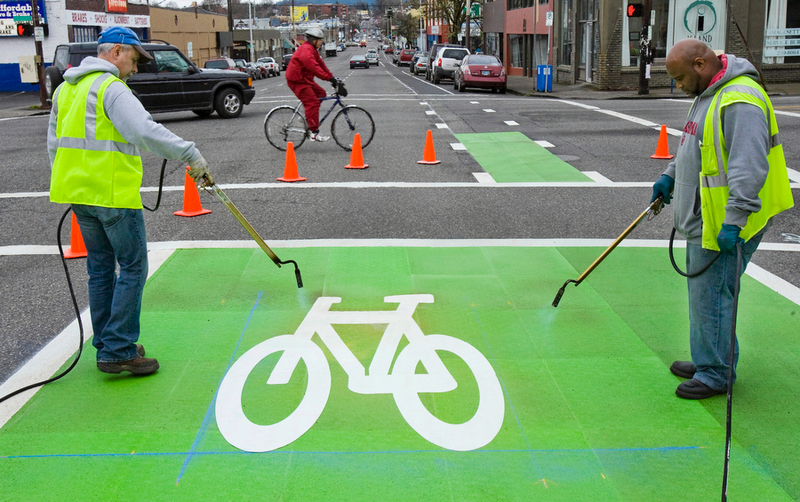 Bike box and automotive thoroughfare: accommodation or tokenism? Cooptation or change? Sign and reality, sign and system: what happens when public space becomes public signage? 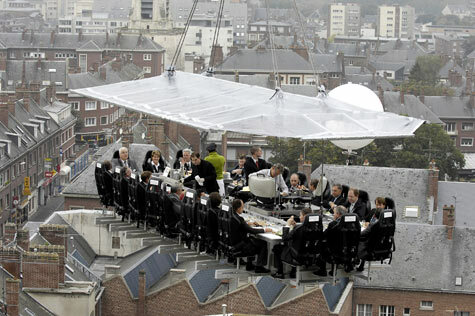 One might speculate about the dinner conversation that occurs while floating above the rooftops. Are they talking about the relationships between luxury, space, and democracy? Do they ask, how much privilege can you purchase before you feel complicit in others’ lack of privilege? What do you see? Harmless pleasure or a fantasy of escape? Want a seat? “The Section 8 program is a truly public-private relationship that serves the needs of low-income families by providing safe, quality housing opportunities using public funds for financial assistance. Public Housing Authorities (PHAs) manage the Section 8 program within specific geographic areas, and they represent the public side of the public-private relationship. 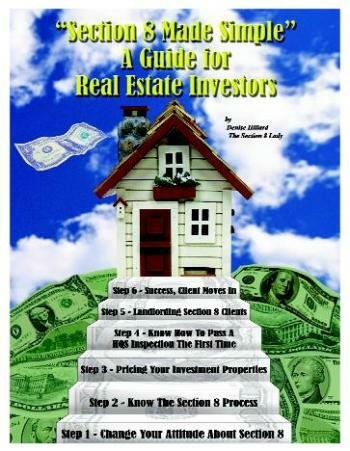 The private side of the relationship is made up of real estate investors who profit by making their investment properties available to the Section 8 program. As you will see, savy real estate investors reap many benefits from the Section 8 program that others who invest in real estate miss completely. This includes on-time rent collection, long-term tenants, shorter vacancy times, and at market or above market rents. But investors who participate in the Section 8 program get an added benefit that doesn’t relate to the bottom line – they are helping to serve the public interests by providing housing to those less fortunate. Given all these benefits, the natural question that comes to mind is “Why don’t all real estate investors participate in Section 8?” Why indeed. If you are serious about your investments I would urge you to seek professional representation to ensure you are getting the most out of your investment and to reduce the time that you must invest in each property. Having said that, this book will give you some tips on how to not only defend yourself, but will show you how to work within the Section 8 program to save you time and a lot of frustration. Buy the book – Learn the process – Make a difference for yourself and your community! One might ask, What exactly is this book selling? How is it selling it? BUILT: Huddled Masses, Living Here? In the coming years, the population of the US will continue to expand with increasing concentration in urban areas. There is no one plan for how that will happen. Where will we live? Will we be thoughtful about that? Can we imagine better cities, neighborhoods, and homes? Will we act to achieve that vision? In the BUILT process, we’ve been working around notions of place, power, ownership, and voice. 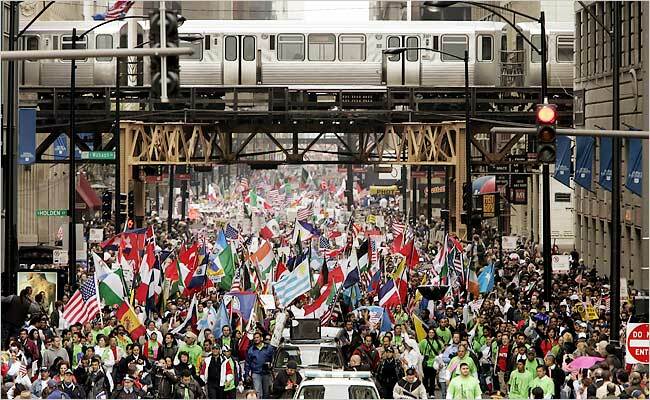 This photo of Chicago residents marching in last year’s national immigration rally foregrounds the role of democratic dissent in urban life. It poses a deeper question as well, one regarding national history (whether in the US or elsewhere): how do we, and how have we, shared space? What factors determine, influence, and establish the right to inhabit space–to claim and name a place? Photograph by Charles Rex Arbogast/Associated Press. The full text of the poem alluded to in the title of this post is available here. Today we introduce a new series at NCN that will run on Fridays for about a month. BUILT explores the changing city in the US and the challenges that will affect housing, infrastructure, neighborhood cohesion, and equity in the coming years. BUILT is a series of research, installation, dialogue, interview, and performance events of varied scale, including the opportunity for public conversation offered at this blog. Several questions come to mind: How do we (and how should we) teach children ideologies of place? 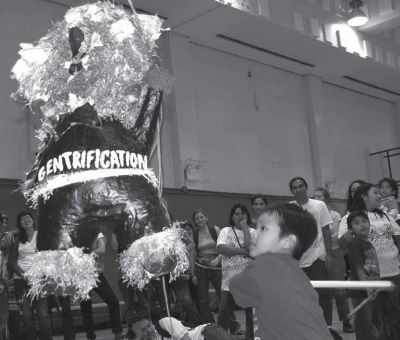 What does this image say about the “side effects” of gentrification? What perspectives on gentrification are excluded by this image? Does it point toward a better alternative?